Multinational corporations are continually involved in what Justice Louis Dembitz Brandeis would call "a race to the bottom." Enough. A recent three-day strike against telecommunications operator AT&T attracted nationwide attention, even though the modern incarnation of the company is a far cry from the gigantic “Ma Bell” monopoly of old. The strike took nearly 40,000 workers off the job. The Communications Workers of America (CWA) union was sending a message to management: Stop stalling, start negotiating. The immediate cause of the strike was the slowness of the company to reach new contracts with the union for improved wages and benefits for some workers, including those in AT&T’s wireless communications network. But underlying the dispute is a long-term strategy by the company to degrade the quality of its U.S. jobs as it shifts much of its business to lower-paid workers overseas, the union says. In a recent report, CWA details some of the facts. Since 2011, the company has closed about 30 U.S. call centers while reducing the number of jobs at dozens of others, the union says. These actions resulted in the elimination of about 12,000 U.S. jobs, with much of the work transferred to call centers in low-cost countries like India and the Philippines. “AT&T employs global contractors to run a large portion of its customer service operations. And AT&T is not simply turning to vendors when its in-house call centers are overloaded. The company has established a permanent global network made up of thousands of low-wage workers around the world who handle a significant share of AT&T’s customer service, sales, tech support, and other services. In addition to India and the Philippines, other major destinations for these outsourced AT&T jobs are the Dominican Republic, Jamaica, El Salvador and Colombia, the union reports. Outsourcing contactors include the large international companies Teleperformance, Convergys and Sutherland, among others. Another recent study, this one reported by the Hindustan Times, estimated the global size of the BPO industry at $186 billion, with India representing about 36 percent of the market. The newspaper also reported that the Philippines and other Asian countries are challenging India’s dominance. “(I)t will be a challenge for India to maintain its leadership position as major countries like US (and) UK continue to look for low-cost options towards south-east Asian countries to remain competitive in the global market,” according to the Hindustan Times article. The CWA reports that the Philippines has the largest number of AT&T-contracted call centers of any country outside of the Unites States. There are at least 16 such centers, across contracted eight companies, the union says. According to the report, surveyed workers at AT&T vendors in the Philippines earn the equivalent of $1.60 to $2.05 per hour for a 40-hour week. Besides low pay, they also have very little say in their working conditions, and reportedly face retaliation when they join together to push for change. The outsourcing is hitting vulnerable communities in the United States hard. Ridgeland, Mississippi, a working-class suburb of Jackson, lost 110 jobs when AT&T closed a call center in December of last year (the center provided nearly 500 jobs back in 2004). Rural Atwater, California, lost 400 jobs when AT&T closed a center there in 2014. And in Pittsburg, the company closed a call center employing 225 workers in 2013. (Twelve people transferred to other AT&T positions.) Back in the 1990s, the Pittsburg center had employed more than 1,000 workers. Union spokeswoman Candice Johnson tells In These Times that the union has seen some progress on contract negotiations since the strike. 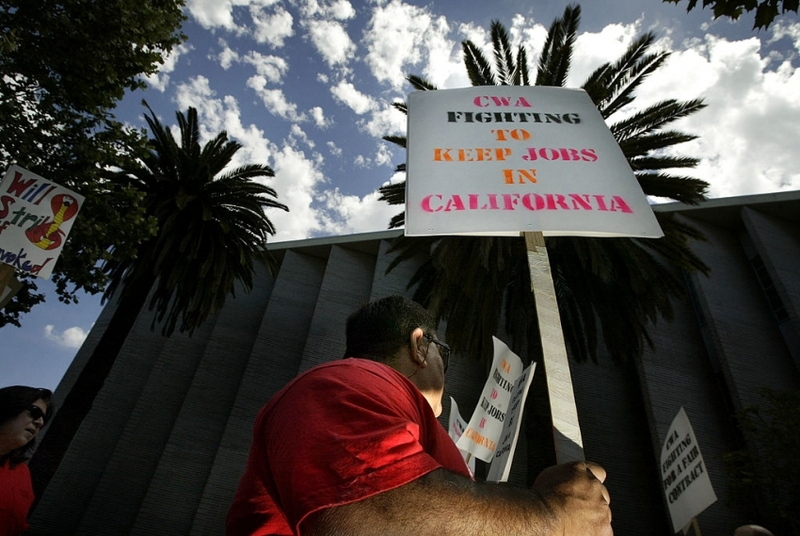 A tentative agreement covering about 17,000 workers in California and Nevada has been reached and a contact ratification vote is being scheduled. Talks covering a larger group of 21,000 union members in other parts of the country are ongoing, but no settlement appears imminent. Whatever the results of the stalled contracts, the union wants an end to the outsourcing (although that is not an explicit contract demand this year), Johnson says. Outside observers are predicting a long struggle ahead, with the possibility of further strikes in the future.